The anatomy of craniovertebral junction bones of the tiger, horse, and deer was analyzed and compared with human bones. The evolutionary changes and structural alterations that have occurred due to the functional variations are clearly seen in the comparison. Understanding the anatomy of these animals clarifies the function of the various components of the bones of the craniovertebral junction. The evolutionary changes in the shapes and architectural design of the craniovertebral junction bones in each of these animals have been perfected to suit the job at hand. 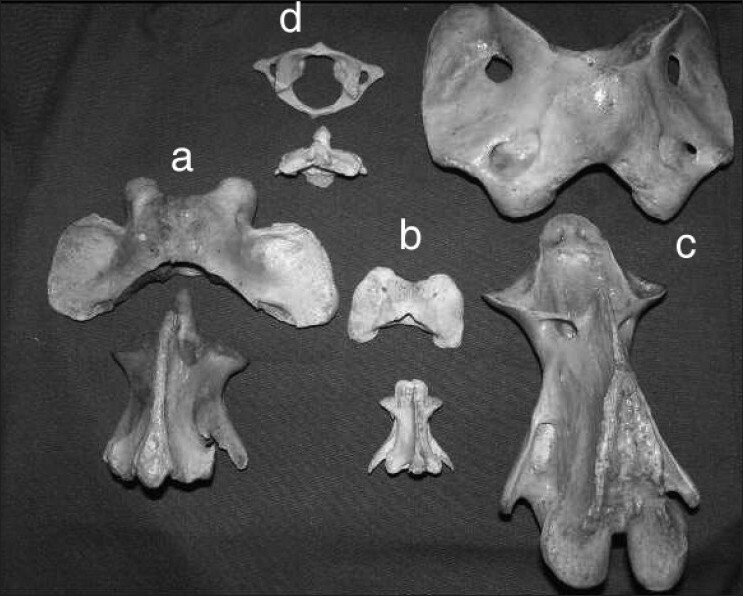 Figure 2: Images of the craniovertebral junction bones of a horse. (a) Inferior view of the posterior aspect of the skull showing the large occipital condyles (1). (b) Superior (anterior) surface of the Atlas More Details, as seen from the superior and anterior perspective, showing the deep 'cup-shaped' articular surface (1) for the articulation with occipital condyles. (c) Inferior surface showing the atlas articulated with the occipital bone. Note the acute flexed position of the head in relationship with the atlas. (d) Posterior view showing the occipitoatlantal articulation. 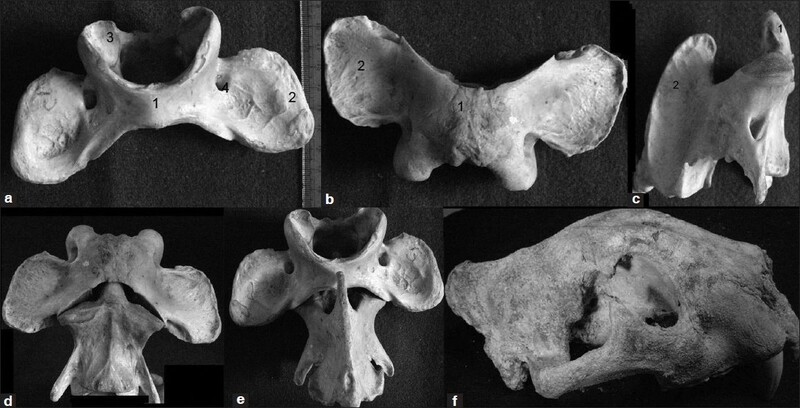 (e) Ventral view of the C1 vertebra showing the ventral arch (1), ventral tubercle (2), transverse process (3), transverse foramen (4), atlantal fossa (5), and superior articular facets (6). (f) Dorsal view of the C1 vertebra showing the dorsal arch (1), the inferior articular facets (2), transverse foramen (3), alar foramen (4), and lateral vertebral foramen (5). (g) Superior view of the axis vertebra of the horse showing the C-shaped configuration of the odontoid process (1) and the deep impressions for the longitudinal ligament (2). The superior articular facets of the axis are seen in relationship with the odontoid process. (h) Anterior view of the C1-C2 articulation. The atlantoaxial joints are relatively flat when compared with the deep concavity of the superior facets of the atlas in relationship with the occipital bone. (i) Posterior view of the C1-C2 articulation. (j) Lateral view of the C1-C2 bones. The notch for the C2 spinal nerve is converted into the lateral vertebral foramen (1) following ossification of the ligament. The major anatomical features that were evaluated are summarized in [Table 1] and [Table 2]. In quadrupeds, the cervical spine is a vertical part of the entire vertebral column and the thoracic spine is more or less horizontally oriented. The head of the tiger, deer, and horse protrudes anteriorly in such a fashion that it is in the maximally flexed position at the occipitoatlantal joint articulation [Figure 2]. On the other hand, the cervicothoracic junction is aligned in the maximally extended position. This 'asymmetric' placement of the vertebrae in quadrupeds ensures an energy-saving balance of the head when the animal is in the resting position. When in the resting position, the movements permitted at the occipitoatlantal articulation are primarily of extension (flexion being gravity-assisted passive movement); accordingly, the posterior cervical neck musculature is markedly strong in these animals. The occipital crest is remarkably thick, providing a site for muscular attachment. The occipital crest is most remarkably thick in the tiger, as seen in [Figure 4]. In humans, the entire spine assumes a general vertical orientation and its curvatures are much less pronounced when compared with the quadrupeds studied. The vertical stance of the human being places the head directly over the neck in line of the weight bearing of the rest of the spine. The muscles of the nape of the neck and the occipital crest in humans are significantly small in dimension. The atlantoaxial bone and joint complex of the tiger have much more remarkable resemblance to human beings than the bones of herbivorous animals such as horse and deer. There is platybasia in all the three animals studied. The clivus and the anterior skull base are in the same horizontal plane. The maxilla and the upper jaw protrude anteriorly from the cranial base. The brain size is relatively small and the olfactory nerves well developed and long, reaching to a length of about a foot in the horse. The cerebellum is proportionately large in animals as compared with the cerebral hemispheres. In humans, the angulation of the anterior skull base in relationship with the clivus is probably related to the relatively large size of the cerebral hemispheres. The atlas bone has ring-shaped anterior and posterior arches and has wide lateral platelike projections or wings of the transverse processes in all the three animals studied [Figure 2],[Figure 3],[Figure 4]. The transverse process in the human atlas is reduced to only the vertebral artery canal. The ventral (anterior) and dorsal (posterior) arches of the atlas are much thicker in the tiger, horse, and deer as compared with the humans. The dorsal arch presents a median tubercle. It is perforated on either side near its cranial margin by the lateral vertebral foramen [Figure 2]. In these animals, the term lateral vertebral foramen is used instead of the term intervertebral foramen in the case of the atlas and axis as this foramen does not lie between the two vertebrae as the term 'inter' implies and rather lies on the dorsal arch of the atlas. The ventral arch is thicker, narrower, and less curved than the dorsal arch. On the ventral surface is the ventral tubercle, which is more prominent in the horse and deer as compared with humans and tiger. Although the transverse processes are large in the horse and deer as compared with humans, they are proportionately smaller in size as compared with those of the tiger. The ventral surfaces of the transverse process of the atlas in the horse and deer have a greater depth than those of a tiger, in which they are shallower but wider. Between the ventral aspect of the transverse process and the lateral mass is a depression called the atlantal fossa. In horses, each wing is perforated by two foramina: the cranial one is the alar foramen, which connects with the lateral vertebral foramen by a short groove; and the caudal one is the transverse foramen [Figure 2]. In tigers, there is a lateral vertebral foramen for the first cervical nerve close to the cranial border of the dorsal arch. The alar foramen is replaced by a notch in the cranial border of the wing that transmits the ventral branch of the first cervical nerve. The base of the wing is perforated by the transverse foramen. While the human transverse process is horizontally oriented (transverse), it is vertically aligned in the animals studied. The articular surface of the superior facet of the atlas accounts for roughly 75% of the entire ring of the atlas as compared with less than 40% in the atlas of humans. The joint surfaces are separated by a wide notch dorsally and a narrow one ventrally. The atlantodental joint is remarkably prominent in the horse and deer, providing articulation to the large and C-shaped odontoid process in these herbivorous animals [Figure 2] and [Figure 3]. The inferior articular surfaces (referred to as posterior articular surface in quadrupeds) of the lateral mass of the atlas are confluent anteriorly with the joint surface on the posterior arch of the atlas to form a saddle-shaped articular surface. In the horse and deer, the axis is the longest of all vertebrae. It measures 16 cm in the horse and 4.9 cm in the deer in its vertical length. The odontoid process of the tiger simulates the odontoid process of a human being. The odontoid process is denslike in human and tiger bones, whereas it is a C-shaped, relatively thin and flat ring that has a wide area of joint formation with the posterior surface of the anterior arch of the atlas [Figure 2],[Figure 3],[Figure 4]. This wide area of the atlantodental joint is seen uniformly in herbivorous animals as against the denslike odontoid process in carnivorous animals. The odontoid process of humans simulates more closely with that of carnivorous animals. The anterior surface of the odontoid process forms a well-defined joint with the posterior surface of the anterior arch of the atlas. The joints of the horse and deer are much larger as compared with those of humans and tiger. The rotatory movements of the neck at the craniovertebral junction are superior in the horse and deer as compared with those of the tiger and humans. The limitations of the rotatory movements at the craniovertebral junction and the placement of eyeballs in a more anterior perspective of the head in the tiger and humans as compared with those in the horse and deer are adaptations that suit their lifestyle and preying, hunting, and survival needs. The dorsal surface of the odontoid process has two deep impressions on either side of the midline in a horse and deer for the attachment of the thick and fan-shaped longitudinal ligament [Figure 2]. This ligament extends from the rough concave dorsal surface of the dens, widens cranially, and is attached to the transverse rough area on the inner surface of the ventral arch of the atlas. These impressions are not prominent in the odontoid process of the tiger and humans. 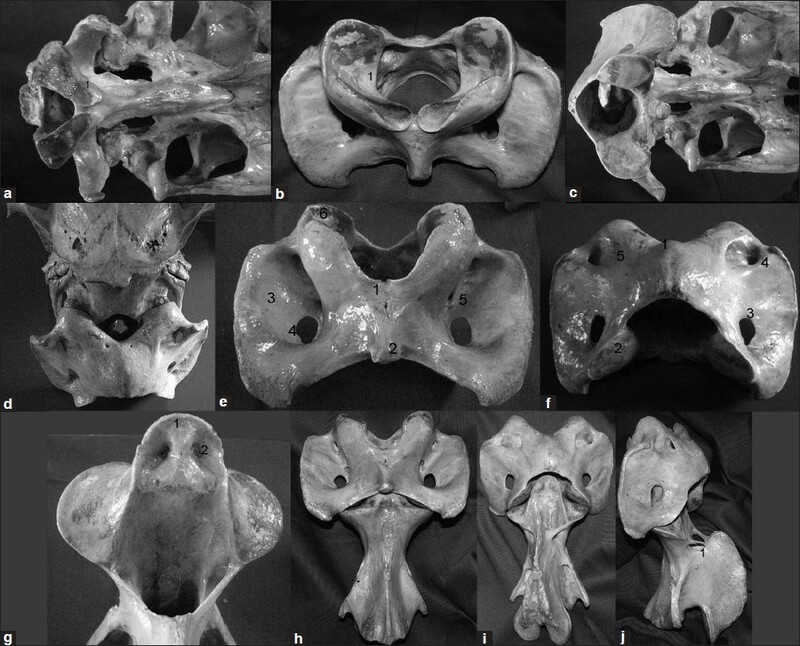 The atlantoaxial joints are relatively similar in their inclination and depth in human beings and in all the three animals studied. In the horse, the lamina or the arch of the axis has a notch on each side of its cranial border that is converted into a lateral vertebral foramen (intervertebral foramen) by a ligament that ossifies later [Figure 2]. A groove extends ventrally and caudally from this foramen and houses the ventral branch of the second cervical spinal nerve. In the deer and tiger, the cranial border has a deep notch that is not converted into a foramen. In humans, there is no such notch or groove. The inferior articular processes of the three animals are vertically oriented as compared with their more horizontal orientation in humans. The transverse process in the deer and horse is small and single and projects caudally. It has an obliquely oriented foramen for the vertebral artery. The transverse process and the vertebral artery foramen in the axis of the tiger are similar to those in humans. The spinous processes of the axis of all the three animals studied are large, strong, and bifid [Figure 1],[Figure 2],[Figure 3],[Figure 4]. The axis in the tiger is characterized by its length and its enormous spinous process, which overhangs both the dorsal arch of the atlas and the laminae of the C3 vertebra. The cranial extent of the spinous process matches that of the dens  [Figure 4]. The C2 spinous process of humans is short, stubby, and bifid and is smaller than that of the other three animals. The lateral surfaces are concave and rough for muscular attachments. The second cervical nerve is larger than the first one in all the three animals, as in humans. It emerges from the spinal canal through the lateral vertebral foramen on the cranial border of the lamina of the axis. This nerve also supplies a number of muscles and skin over the neck. Their function is also significantly in excess to that in humans. The craniocervical junction bones form a pillar of stability and mobility. The basic architecture and design have remarkable similarities in all the animals studied. The variations in morphometry have a relationship with the quadruped stance, acute flexion position of the neck in the neutral position, and hunting and survival needs of the individual animal. 1. Goel A, Shah A, Gaikwad S, Dhande P, Kothari M. Comparative Quantitative Analysis of Osseous Anatomy of the Craniovertebral Junction of the Tiger, Horse, Deer, Bird and Human. In: Goal A, Cacciola F, editors. The Craniovertebral Junction. Diagnosis, Pathology, Surgical Techniques. 1st ed.Stuttgart, Germany:Thieme; 2011. Pp 2-12. 2. Cacciola F, Phalke U, Goel A. Vertebral artery in relationship to C1-C2 vertebrae: An anatomical study. Neurol India 2004;52:178-84. 3. Getty R. Sisson and Grossman's The Anatomy of the Domestic Animals. Philadelphia: W. B. Saunders Company; 1975. 4. Graf W, de Waele C, Vidal PP. Functional anatomy of the head-neck movement system of quadrupedal and bipedal mammals. J Anat 1995;186:55-74. 5. Graf W, Vidal PP, Evinger LC. How animals move their heads. Proc Int Union Physiol Sci 1986;16:394-411. 6. Dyce KM, Sack WO, Wensing CJ. Textbook of Veterinary anatomy. Philadelphia: W. B. Saunders Company;1987. 7. S, Goel A. Quantitative anatomy of the lateral masses of the atlas and axis vertebrae. Neurol India 2000;48:120-5.